I would have liked to edit these movies together alas I can't figure out how to do it in iMovie. I think perhaps it's not possible in the format my phone records and I don't care to try to figure it out. It's funny what things look like at night. A large tree stump looked like an elephant, the reflective eyes of the deer like marbles. I hit a bunch of potholes, even though I was intently scanning the road. I slid out on a manhole cover, and Grrmin took me on a very dangerous, ultra busy busy road that I thought might surely kill me. I was so happy with the ride for several reasons. First, it's a gorgeous night. 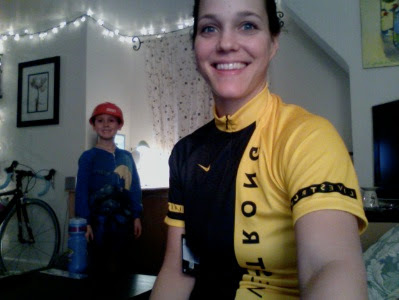 It started raining ever so slightly when I started, but I was determined to do justice to my LiveStrong jersey that arrived today. I felt strong. I felt my body remembering how I ride- three months is a long time to not ride regularly. 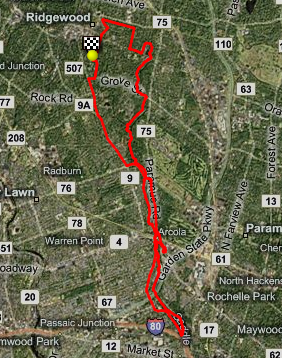 My legs were loving the effort, and I was able to maintain 18-20 mph for quite some time. I particularly loved maintaining my cadence up the small inclines. I don't know what exactly it was, my body just fell into the rhythm. I didn't need my usual 10 mile warm up- maybe that's the effect of my better nutrition? Who knows. But it was a fun night, that's for sure. And p.s. the LiveStrong jersey is extremely comfortable and well-fitting. I'm excited to be wearing it.